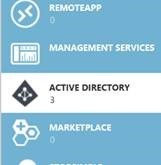 You can find the exhaustive list in Cloud Identity & Azure Active Directory page. This is the fourth lab. In the current lab we configure Azure AD application to emit more claims in the authentication token. If you test the Web App (deployed in a previous lab), you should see that you have new claims of type “groups” with the unique identifier of the groups the user is member of as value.